“If you are going to achieve excellence in big things, you develop the habit in little matters. Our mission and yours is identical: To help your people get Fit Smart Fast. You want your employees to become healthier and more productive. We want this too, so we created a special Learn & Burn bundle that is value-priced as low as $20/employee — which includes over $210 in dynamic, easily-accessed, self-administered, instantly-effective training programs. It is unconditionally guaranteed to help your people produce substantially better Results, or your money back. Plus, we will be happy to schedule a highly motivational and inspirational Champion of Fitness Key Note Speaker for your next corporate event! 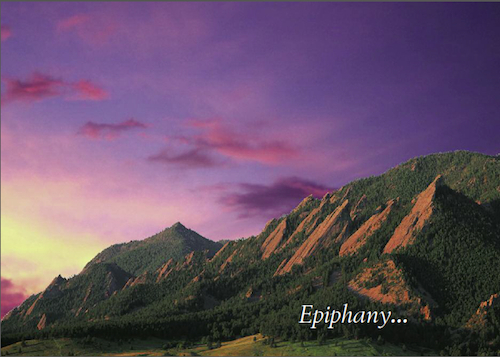 Think TQ, Inc. is the world’s leading publisher of virtual training products for personal and professional excellence. Over the last 17 years, we have created leading edge tools and technology to help people engage in Continuous Personal Improvement through a simple 3 step process of Self-Measurement… Self-Evaluation… and Self-Improvement. This drives a heightened level of Self-Efficacy (your inner-belief in your power to produce results — what psychologists call “learned optimism”)… which leads to greater Self-Confidence… and ultimately, leads to greater Self-Esteem. A workforce comprised of people with all 3 represents the optimum in performance excellence… and translates into an unstoppable competitive edge. Because our programs are highly personal, they succeed where other “forced” approaches to personal development fail. People naturally want to move forward with TQ programs, simply because they are immediately useful… immediately insightful… and help people immediately produce far greater Results — in far less Time — personally and professionally. Better, you can make this revolutionary new system available to your entire workforce at the click of a button. We created the entire Learn & Burn brand to remove all barriers to instant personal growth. Instead of just “vibin to the tunes” as you workout, Success Essentials gives you thousands of great ideas for action — set to pulse-pounding music — that truly connects the concept of SWEAT with SUCCESS! We do not use the word INSTANTLY loosely. You then have the specific instructions needed to INSTANTLY address your performance from a fresh new perspective. Set your Learn & Burn to the area of your performance you want to improve, and you will INSTANTLY be given the exact help you need. 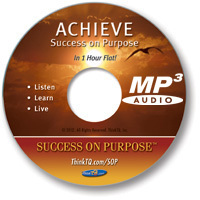 This single MP3 CD contains the equivalent of 12 CDs worth of heart-pounding tunes, together with thousands of highly motivational and inspirational ideas for action to achieve success without limits. be LEARNING while you are BURNING! 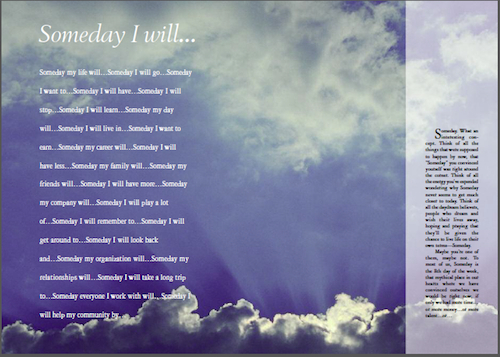 Gain hundreds of success-critical ideas to turn your HOPES and DREAMS into ACHIEVABLE GOALS! 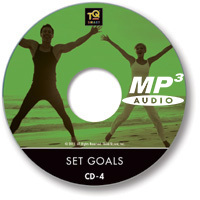 Track 4: SET GOALS is the fourth color of your performance, because the difference between a DREAM and a GOAL is a DEADLINE. Here you will learn how to transform your dreams into crystal-clear goals! Track 5: MAKE PLANS is the next critical color of your performance, because a GOAL without a PLAN is nothing more than a WISH without a HOPE. Achieve your biggest GOALS easier, by turning your dreams into ROCK-SOLID PLANS. 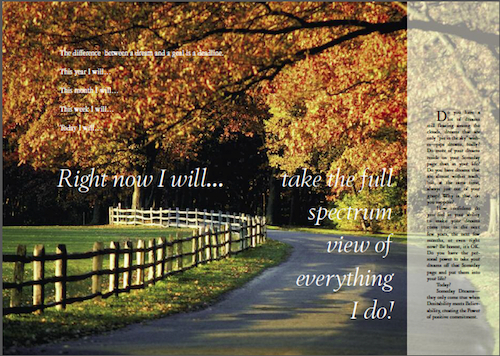 Track 7: SYNERGIZE is the seventh color, because you won’t achieve much trying to be an ARMY OF ONE. Gain hundreds of simple ideas to help you GET and STAY organized… NOW! 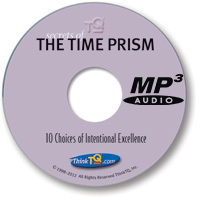 Track 9: OPTIMIZING your TIME is the key to achieving MAXIMUM RESULTS. Make time your MONEY MACHINE, and you will grow rich! The issue is not Time Management — it is TIME MASTERY! You will learn the nuts and bolts of enduring success. These are three of our most popular, full-length TQ training resources! 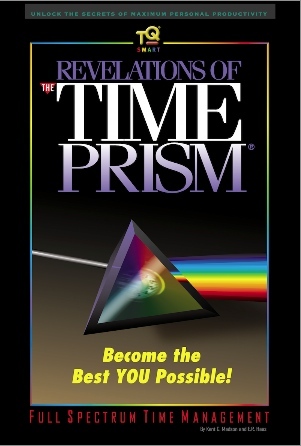 Here you will learn about the creation of the world’s first Time Prism and why it is the KEY to achieving your heart’s desire. Think of this as your INSTRUCTION MANUAL for becoming the BEST YOU POSSIBLE… the pure essence of Full Spectrum Time Management! 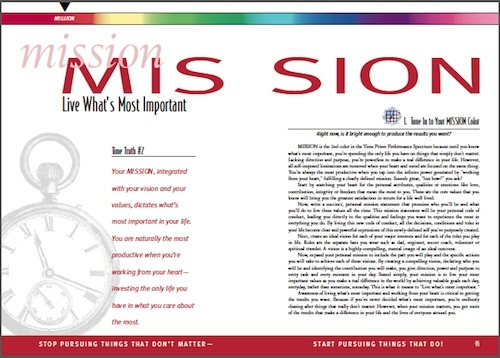 It is the most important book on Time Mastery yet written. and the information you need to succeed! Now, a little background on TQ. ThinkTQ, Inc. is in the business of measuring and improving human potential — YOUR potential for true and lasting success. In a way, we are in business to measure your heart’s desire, and your ability to live it. Through our quantitative and qualitative methodologies, we will help you get down to the real issues driving your success and failures… real fast. You’ve probably read many of the same books we used as the source for your Learn and Burn system: The 7 Habits of Highly Effective People, Unlimited Power, In Search of Excellence, The One Minute Manager, Managing For Results, Getting to YES, Who Moved My Cheese, Get off your “Buts” and Do It, Tough Times Don’t Last, Tough People Do and hundreds of others written by experts such as Stephen Covey, Anthony Robbins, Robert Schuller, Tom Peters and Zig Ziglar to name a few. No question, these authors all have fantastic, life-changing ideas, tips, techniques and great advice for improving results and achieving greater success. But here’s the problem. These brilliant ideas are all locked inside the books — up on the shelf — out-of-sight, out-of-mind. To cure this out-of-sight — out-of-mind problem — our staff researched over 100,000 pages of timeless gems of wisdom, from over 300 different authors. We then color-coded thousands of individual ideas for action — and completely rewrote them — in concise, on-point, simple-to-understand language… with all the fluff, duplication and philosophies eliminated. So, what you get is the pure heart of the matter — some 1,500 Key Ideas for personal improvement — each color-coded to the 10 Colors, and 100 key Factor actions that drive your performance. Thus, we are able to take all this fabulous advice off the shelf, and put it into your life — where you can actually HEAR it… REMEMBER it… indeed, USE it and ACT on it— to instantly become a great deal more efficient, productive and effective. Or, in a word, to help you become a great deal more SUCCESSFUL.